A Canadian man who was recently freed after five years in Taliban captivity initially didn't believe Donald Trump was elected US president. Joshua Boyle, who returned home to Canada on Friday evening after a five year ordeal, was told by one of the captors that Trump had been elected president late last year prior to filming a "proof-of-life" video. "It didn’t enter my mind that he was being serious," Boyle told The Toronto Star, in a wide-ranging interview from Boyle's parents house outside of Toronto. Boyle, and his wife, Caitlan Coleman, were kidnapped by the Taliban-allied Haqqani network after traveling to Kabul, Afghanistan in 2012. The couple was held in a series of tiny, underground cells along the Afghanistan-Pakistan with little access to television, radio, or any reading materials. Boyle told The Star that some of the cells they were held in were no larger than a bathtub, and the only entertainment they were provided was a piece of chalk and a slate. He also recounted horrific details of the ordeal, alleging that his wife had been raped by the captors and was forced to abort a baby. Coleman and Boyle had three children in captivity, who are now adjusting to life in Canada. Coleman was five months pregnant when she was kidnapped, and the couple told The Star they kept Coleman's second pregnancy secret, right up until the moment of birth. The family was freed by Pakistani security officers, operating on US intelligence, in a bloody shootout that left their captors dead. Boyle was initially reluctant to get on a US transport plane after being freed. One US official told The Associated Press that Boyle had been nervous about being in "custody" because of his background, though another official clarified that the family was not formally in US custody. U.S. President Donald Trump, first lady Melania Trump and son Barron walk during the inaugural parade from the U.S. Capitol in Washington, U.S., January 20, 2017. Washington D.C. motorcycle police lead the inaugural parade for U.S. President Donald Trump after he was sworn in at the Capitol (background) in Washington, U.S., January 20, 2017. U.S. President Donald Trump (R) waves to supporters as he walks the parade route with first lady Melania Trump during the Inaugural Parade on January 20, 2017 in Washington, DC. Donald J. Trump was sworn in today as the 45th president of the United States. The family of US President Donald Trump arrives at the reviewing stand at the White House in Washington, DC, on January 20, 2107 following swearing-in ceremonies on Capitol Hill earlier today. From (L-R): son Barron, son Eric and wife Lara, daughters Ivanka and Tiffany and daughter-in-law Vanessa (extreme R). Newly inaugurated U.S. Vice President Mike Pence looks out the window of his limousine during the inauguration parade in Washington, U.S., January 20, 2017. The U.S. Army band "Pershing's Own" marches in the parade carrying U.S. President Donald Trump following his inauguration in Washington, U.S., January 20, 2017. U.S. President Donald Trump waves as he and his wife Melania walk during the inaugural Parade in Washington, January 20, 2017. Donald Trump was sworn in earlier as the 45th President of the United States. U.S. President Donald Trump waves from inside his limousine as he participates in the inaugural parade after his swearing in at the Capitol in Washington, U.S., January 20, 2017. Ivanka Trump walks with her son Theo during the inaugural parade in Washington, DC, on January 20, 2107.ï¿½ US President Donald Trump on Friday stepped out of his limousine along the inaugural parade route, briefly walking on Pennsylvania Avenue and waving to supporters with his wife Melania and young son Barron. Earlier, the president drove past a crowd of protesters chanting anti-Trump slogans and waving banners. US President Donald Trump stands with First Lady Melania Trump at the Capitol Building before departing for the parade after Trump is sworn in on Capitol Hill in Washington, D.C. on January 20, 2017. U.S. President Donald Trump waves to supporters as he walks the parade route with first lady Melania Trump and son Barron Trump past the main reviewing stand in front of the White House during the Inaugural Parade on January 20, 2017 in Washington, DC. Donald J. Trump was sworn in today as the 45th president of the United States. US President Donald Trump walks his wife Melania surrounded by Secret Service officers outside the White House as the presidential inaugural parade winds through the nation's capital on January 20, 2017 in Washington, DC. Marchers take part in the inaugural parade of U.S. President Donald Trump in Washington, January 20, 2017. Donald Trump was sworn in as 45th President of the United States. The family of US President Donald Trump arrives at the reviewing stand at the White House in Washington, DC, on January 20, 2107 following swearing-in ceremonies on Capitol Hill earlier today. From (L-R): First Lady Melania Trump, son Barron, son Eric and wife Lara, daughters Ivanka and Tiffany and daughter-in-law Vanessa (extreme R). U.S. President Donald Trump's Housing and Urban Development Secretary nominee Ben Carson arrives to take his seat for the inaugural parade in Washington, January 20, 2017. 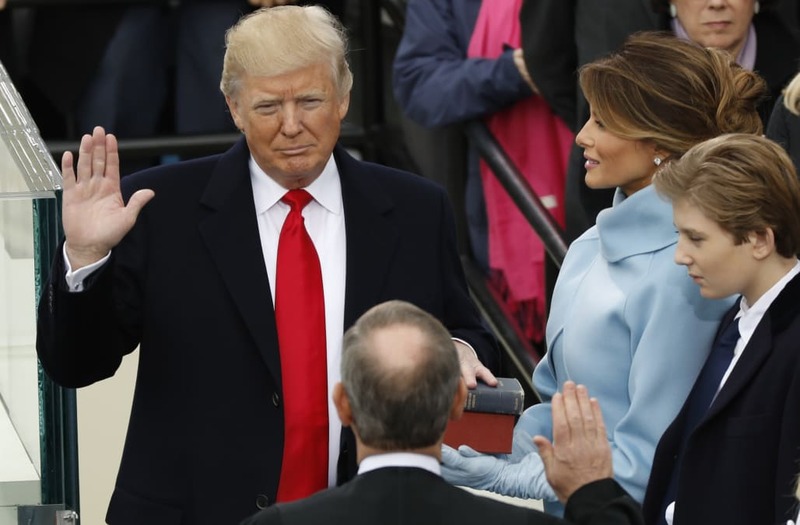 Donald Trump was sworn in as 45th President of the United States. US Vice President Mike Pence and his wife Karen wave as they arrive in front of the White House for the presidential inaugural parade on January 20, 2017 in Washington, DC. Former Texas Governor Rick Perry arrives for the presidential inaugural parade in front of the White House on January 20, 2017, in Washington, DC. Donald Trump was sworn in as the 45th president of the United States. A view of atmosphere at the Presidential Inaugural Parade on January 20, 2017 in Washington, DC. Participants march in period costume during the inaugural parade following U.S. President Donald Trump's swearing in at the Capitol in Washington, U.S., January 20, 2017. Newly inaugurated U.S. President Donald Trump salutes as he presides over a military parade during Trump's swearing ceremony in Washington, U.S., January 20, 2017. US Defense Secretary nominee James Mattis arrives for the presidential inaugural parade in front of the White House on January 20, 2017, in Washington, DC. Donald Trump was sworn in as the 45th president of the Uniited States. The family took a commercial flight back to Canada. Boyle's trip to Afghanistan raised eyebrows. He was formerly married to Zaynab Khadr, the older sister of Omar Khadr, a former Guantanamo Bay detainee, and the son of a prominent Al-Qaeda financier. Omar Khadr — then only 15 years old — was captured by US forces following a firefight that left a US Army Sergeant dead in 2002. And Coleman's father, Jim Coleman, told "Good Morning America" on Friday: "Taking your pregnant wife to a very dangerous place, to me, and the kind of person I am, it's unconscionable." Boyle responded, saying that he is a "harmless hippie," and that he and Coleman went to Afghanistan for humanitarian reasons. "Anybody who knows me would laugh at the notion that I went with designs on becoming a combatant," Boyle told The Star. As for his captors, Boyle told The Star the Haqqani network "are people who have no relationships in life that are not purely mercenary." "They have no real friends, only cohorts. They have no wives, children. Those we met who were not orphans spoke of hating their parents," Boyle added. For now, Boyle said he's looking forward to spending quality time with his kids. Boyle told The Star his oldest child, Jonah, aged 4, was "so excited" to be free "he just wanted to sit on his pile of toys with a gigantic smile on his face." "He wanted to sit there and bask in being 'no bandi' after all of this time," Boyle said. "Bandi," according to the Star, is what Haqqani captors call their hostages.